ELIDA — Celina head coach Andy Mikesell knows his pitching staff is somewhat depleted this season so he is hoping the hurlers he does have can deliver when called upon. The Celina bullpen did that twice against Elida to help the visiting Bulldogs record a 6-4 victory in a Western Buckeye League confrontation Friday night. With the win Celina improves to 5-4 and 2-1 in the WBL, and Elida falls to 1-3 in league action and 8-4 for the season. Celina’s Bransen Miller was called on in relief in the first inning after starter Ethan Piper opened the game with three walks and a hits baseman to give up one run and then another run came across on an error. Enter Miller with the bases loaded. Miller did surrender a sacrifice fly for Elida’s third run of the frame, but the Bulldog hurler finished off the rest of the inning unscathed and Elida led 3-0 after one. Elida would not manufacture any more runs until the seventh inning when down 6-3. From the end of the first until the middle of the seventh, Miller silenced the Elida bats to no runs on five hits. Miller showed signs of getting tired in the bottom of the seventh when he surrendered a single to open the frame followed by an error and back-to-back Elida singles to score one run and cut the lead to 6-4 with no outs and the bases loaded. Enter Bulldog reliever Grant Wagner who came in and struck out the first batter he faced and then it was followed by an unusual 1-2-3 double play to end the game. “Baseball happens and it was the third time they have seen him (Miller), and they got used to him and started hitting him a little bit so we said let’s try a little bit more of a change and let’s go to Grant, and we got a good defensive play at the end there to close it out,” Mikesell said. For the game, Miller pitched five and two-third innings and scattered five hits while fanning five and walking three. Wagner went two-thirds of an inning and got one strikeout. Elida head coach Todd Grapner said gaining an early lead and then letting it slip away has been the team’s modus operandi this year. 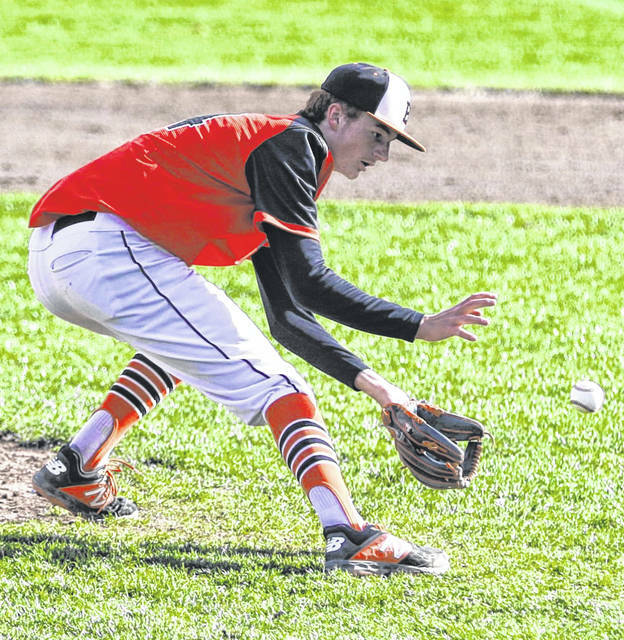 While Celina relied on its relief, Elida rode ace Brayden Lybarger who was sharp for the first three innings, not allowing a hit and facing the minimum nine batters but in the fourth Celina tagged him for two runs on two hits. Miller came through with a big double in that frame that saw one run score and a second on a bad throw to the plate to cut the lead to 3-2. Celina tied the score in the sixth and then tacked on three more in the seventh by taking advantage of a Lybarger’s poor control when he gave up four walks, a single and a hit batsman. Lybarger went six and two-third while giving up five hits, walking six and striking out five. Noah Adcock finished out the final frame. This entry was tagged celina, Elida. Bookmark the permalink.